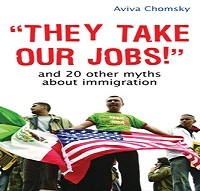 Dr Aviva Chomsky is a professor and the coordinator of Latin American Studies at Salem State College. She has previously been a professor at Bates College and a faculty research associate at Harvard University, specializing in the history of Latin America and the Caribbean. The eldest daughter of linguist and political activist Noam Chomsky, she has a longstanding interest in Latin American cultures and histories which she traces to the year she spent working for the United Farm Workers union in 1976-77. Her six books and many articles explore, among other questions, the history of immigration, labor, globalization, and social mobilization in Latin America and in the United States. This entry was posted in Uncategorized and tagged Aviva Chomsky, be the media, bloggers, borders, community, dispatches, environment, global news, global warming, how to listen, immigration, international, internet, interviews, itunes, labor, latin waves media, media, media democracy, media search engine, membership, movements, nother world is possible, on-air, passion, political, politics, radio, social change, Stuart Richardson, Sylvia Richardson, syndicated. Bookmark the permalink.